If our neighborhood kids have any hope getting candy from us this year it’s solely because I made these cupcakes to distract Mr. Dessert For Two from the Halloween candy bowl. We have discussed his unusual predilection for mint (including peanut butter and mint jelly sandwiches). I’m afraid I’ve been abusing my powers with mint. Just this weekend, I filled my purse with my homemade peppermint patties and used them to ease him through the process of buying new furniture for our living room. We went into a store looking for a couch. After a few hours and a few peppermint patties, we came out with a couch, two chairs for sitting by the fireplace, and a gorgeous reclaimed wood table. The power of mint. 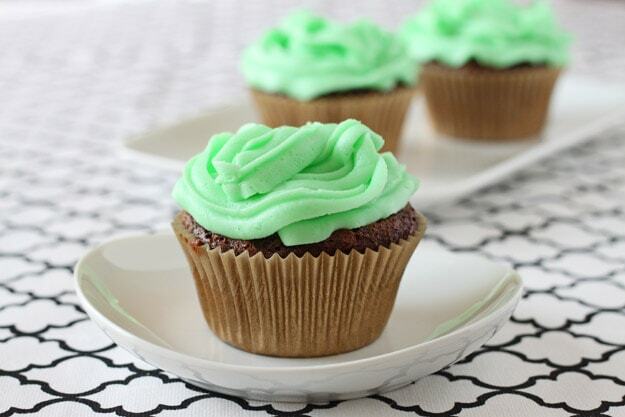 Preheat the oven to 350 and line 4 cups in a muffin pan with cupcake liners. In a medium bowl, whisk together the flour, cocoa powder, baking soda, baking powder and instant espresso powder. In a small bowl, stir together the oil, vanilla, brown sugar and buttermilk. Stir well to dissolve brown sugar. Combine wet and dry ingredients and stir until just combined. Divide the batter between the 4 cupcake liners and bake for 14-17 minutes, or until done. Let cool completely. In a medium bowl, beat together with an electric mixer the powdered sugar, butter, cream, peppermint extract and food coloring. Beat very well until fluffy. 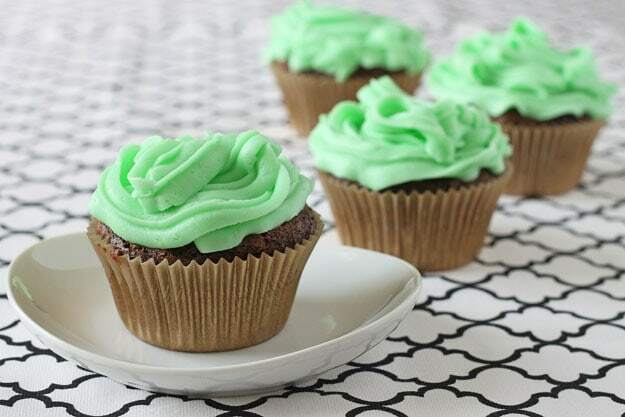 Frost cupcakes and serve. peanut butter and mint jelly?? he can keep that one! these cupcakes as beautiful! Reading about you bringing peppermint patties along to furniture shop TOTALLY cracked me up. I need to force my husband to go shopping for new dress clothes, and my plan is to entice him with a trip to DQ afterwards. Sweets are a super motivator! you are so WISE Christina! I will remember this trick the next time I have to drag my husband to the shops!!!! These look amazing! Your peppermint patties are the very best too! Peanut Butter and Mint Jelly???? That is just all kinds of wrong. But these cupcakes are so right!! I was just thinking chocolate mint “something” yesterday and here you are with a Dessert For Two recipe! Your timing is impeccable. (As was your shopping coercing…I mean coping… strategy.) ;) Thanks, Christina, for the recipe and the smile for the day! One of my favorite combinations! You can bribe me with mint too, hehe. oMG. these look SO good for Christmas!!! These are so much better than halloween candy! Wonderful combination mint and chocolate. It would keep me out of the candy bowl for sure! Looks awesome! I love the combination of chocolate and mint. I love chocolate and mint together! Delicious treat and smart colors for Halloween! Hope you have a fun time celebrating! I’ll have to pack my purse with candy next time my boyfriend and I go furniture shopping. Maybe I’ll get that pottery barn dresser I have been lusting after. Yum! I love mint too! Now I have to ask, WHERE did you get those cupcake liners? I love them! I made these tonight and they were perfect. 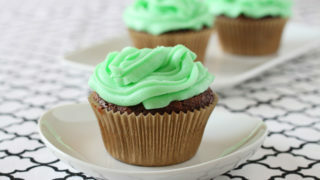 The cupcake was light and moist and the frosting was a rich flavorful treat. Great for a Christmas treat!